Managing all household expenses and routines after her mother, a single parent, died four years ago, when Bianca was a senior in high school. Caring for her two brothers, both of whom have severe special needs. Shuttling to and from class, multiple on-campus jobs, an off-campus job, and home, with cabs and trains her only means of transportation. Yet, somehow, Bianca has survived and thrived in the face of harrowing hardships. 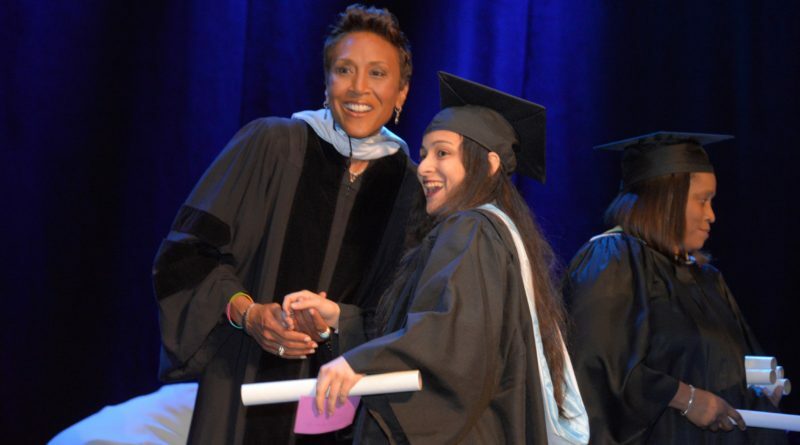 That she has earned her degree in English from The College of New Rochelle (CNR) having maintained a grade-point average above 3.5 is a testament to her indefatigable spirit, and to the schools exceptional demonstrations of caring and support. It is an accomplishment Ill carry with me for the rest of my life, says Bianca, a Bronx resident who also received a Forensic Science Certificate from CNR. I wouldnt change anything for the world, because its my life, and its made me who I am today. Bianca graduated from CNR on Tuesday, May 24, as an honor student; founder of CNRs Anime Club; Editor-in-Chief of Phoenix, the schools literary and arts magazine; and author of a graphic novel, the first three chapters of which have just been published. She will pursue a career either in management with the ASPCA or a stint in the New York City police academy that would eventually allow her to transfer to an animal cruelty unit. Bianca accomplished all of this despite a litany of devastating circumstances. Her oldest brother, Paul, 34, suffers from renal failure requiring grueling dialysis. Her other brother, Michael, 26, has Down syndrome and requires supervision because he doesnt eat or sleep normally. Earlier in her life, her family spent seven years in homeless shelters. Her mother died in February 2012, shortly after Bianca had been accepted to CNR. With there no longer being a head of household, the scholarships and awards Bianca received as financial aid became null and void. Bianca alerted CNR to the circumstances that had befallen her, and that she could no longer afford to attend the school. Instead of turning her away, CNR affirmed its commitment to her. Admissions officers reworked her financial aid package within 24 hours. Bianca never looked back Theres only one way to look, and thats forward, she says and the commitment between school and student remained strong. Students and faculty, aware of Biancas travails, were generous with their time, patience and assistance. She even got the opportunity to study for three weeks in London, with a close friend assuming Biancas role as brothers keeper at their Bronx apartment. The College of New Rochelle gave me ample opportunity I never would have gotten anywhere else, Bianca says. I dont think I would have been able to found a club, study abroad, accomplish everything Ive accomplished, if not for the incredible CNR community. The College of New Rochelle is ranked by U.S. News and World Report in the Top Tier among Regional Universities in the north and is among the Top 10 in New York and the Top 100 in the nation among Washington Monthlys Masters Universities. Recognized as a Catholic College of Distinction, it has been named for five consecutive years to the Presidents Community Service Honor Roll, the highest federal recognition a college or university can receive for its commitment to volunteering, service-learning, and civic engagement. The first Catholic college for women in New York State, The College of New Rochelle was founded in 1904 by the Ursuline Order. Today, it comprises the School of Arts & Sciences, the School of New Resources (for adult learners), the School of Nursing and the Graduate School. The main campus of the College is located in lower Westchester County, 16 miles north of New York City. The College maintains seven locations for the School of New Resources in Brooklyn, Co-op City, the South Bronx, Harlem, New Rochelle, Yonkers and at DC-37 Union Headquarters in Manhattan. Visit the Colleges website at www.cnr.edu.